No, it’s actually quite the opposite. The ingredients in your typical caesar salad are generally calorie-laden, and loaded with simple carbs, saturated fat, and sodium. Not exactly the recipe for getting fit and healthy, which, at H & H Living, is our primary mission the majority of the time when making food choices.. But that doesn’t mean we call it quits on the caesar salad, RIGHT?! No way, jose! INSTEAD, that means that we whip up an alternative version that contains healthy fats, protein and a TON of fibre with just the right amount of crunch, creaminess and flavour! Several years ago, I started eliminating dairy because I found that it didn’t always agree with my stomach, or my skin for that matter (you can read more about that in my pregnancy acne post), so that meant more experimentation with dairy-free recipes. Because one of the primary flavouring agents in caesar salad is parmesan cheese, that meant coming up with a dairy-free caesar salad recipe. Now I know what you’re probably thinking. If there’s no parmesan cheese, there’s absolutely NO WAY that this is going to taste like caesar salad. BUT I found that by combining tahini with some nutritional yeast and other flavouring agents like garlic and lemon juice, the taste and texture very closely resembles a caesar salad dressing. So the next obstacle, is how do we get that crunchy texture that we normally get from the croutons and the flavour from the bacon? Well, this is where we throw in some crunchy and flavour-packed roasted chickpeas. 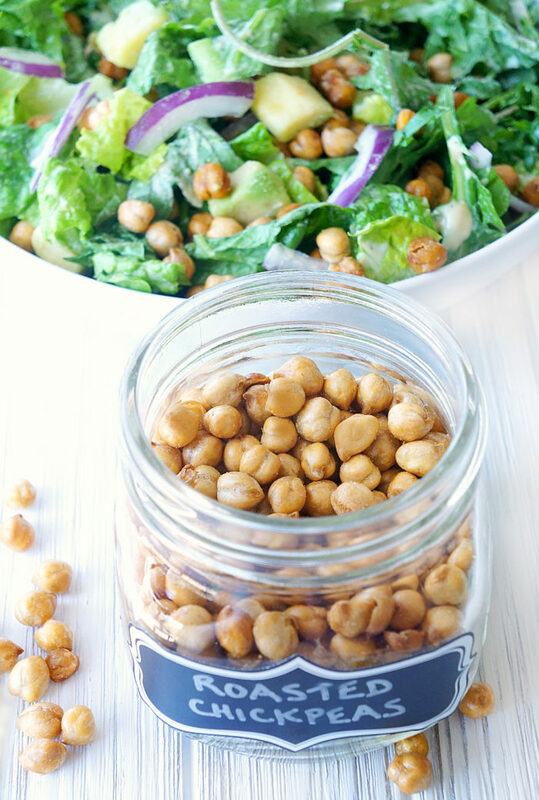 I like to make up a batch of these roasted sriracha chickpeas at the beginning of the week and generally, I’ll save half the batch to snack on and the other half of the recipe will be used to incorporate into this salad. That’s meal prepping at its finest! Making enough food for snacks and meals AT THE SAME TIME. And while we’re in meal prep mode and those chickpeas are busy roasting and getting all good and crunchy in the oven, it’s the perfect time to whip up the caesar dressing. Once again, I like to make a batch of this dressing in my Magic Bullet and use it throughout the week. I like to use this strategy with all of my favourite dressings (like this strawberry and blueberry balsamic dressing), and store them in the fridge for later use. They usually last for at least a couple of weeks. This is one of my favourite meal prepping methods because this way, you always have those healthier homemade dressings on hand and basically just have to assemble the salad and drizzle on that dressing when the salad craving hits. Which brings me to my next point. Now that you’ve prepped the roasted sriracha chickpeas and dressing, the majority of the work is DONE. Doesn’t it feel good to have a meal that you might have on Wednesday pretty much done on Sunday? 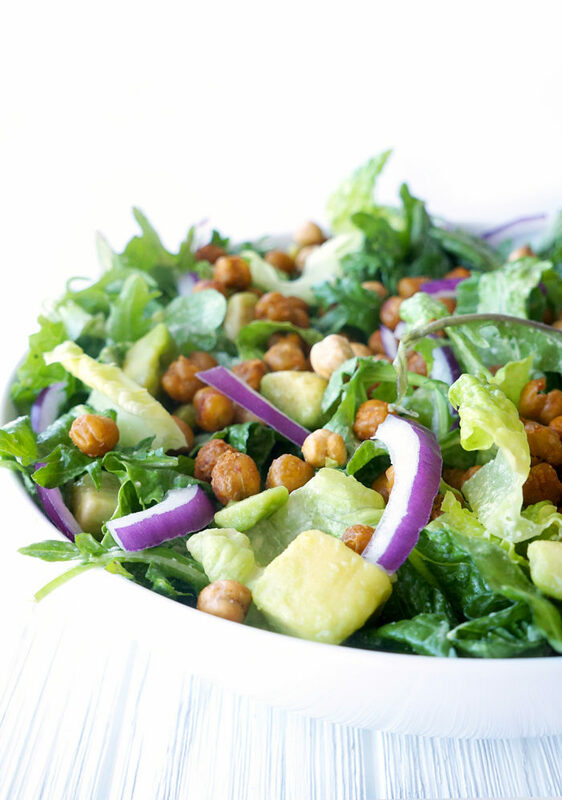 Now, when Wednesday rolls around (or whatever day you choose to whip up this bowl of deliciousness), all you have to do is chop the romaine lettuce, onions, and avocado…and really, you could do that in advance too! This salad is sounding better and better all the time, right?? 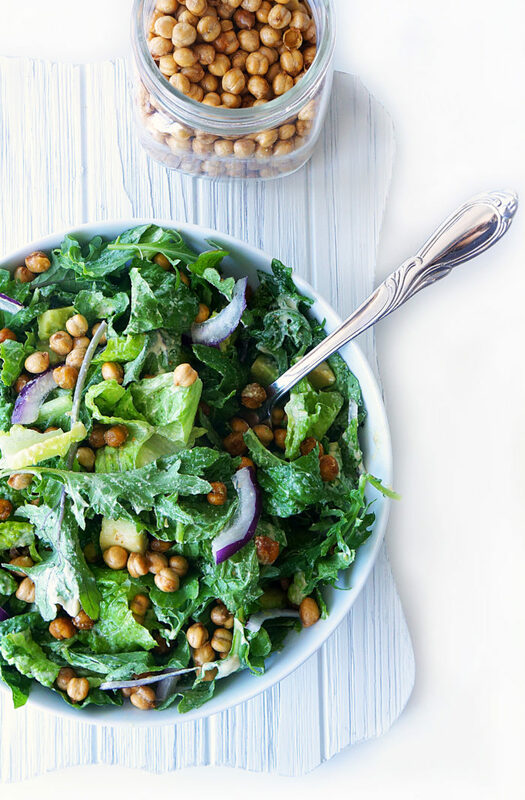 Simply toss in the roasted chickpeas and dressing when you’re ready to dive in and get ready to experience a mouthwatering totally dairy and gluten-free caesar salad! All in all, this recipe either makes two meal sized salads…(and by the way, you can totally throw in some grilled chicken to the mix too if you’re looking for a non-vegan version) or about four smaller side salads. Make a batch of the roasted sriracha chickpeas. 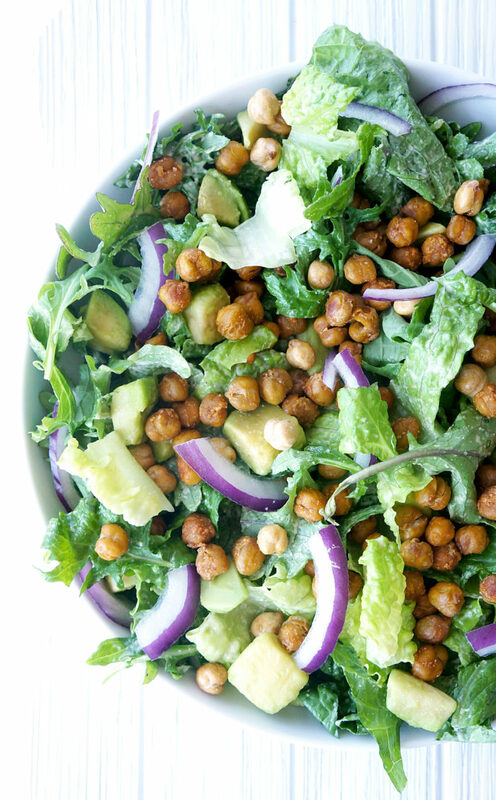 Combine ingredients for tahini dressing in a medium-sized bowl or magic bullet and mix until well-combined. Next, combine the ingredients for the salad in a large bowl. Once the chickpeas are done roasting, allow them to cool for several minutes. Once cool, add them to the salad and toss with desired amount of dressing (I used half the dressing for this recipe). **If you're looking for a non-vegan salad, you can also add grilled chicken to further increase the protein content. I recommend using this marinade to marinate the chicken breasts prior to placing it on the grill. Once fully cooked, slice chicken breasts and toss together with salad. I love this recipe! I always make kale salads and roasted chickpeas but never together before! Delicious! I’ve never tried cassava flour before! I’ll have to look for that next time I go shopping so I can try this recipe – sounds delish! Yum! This caesar salad looks so scrumptious! I love that it’s vegan as I try to eat that way at least once a week, if not twice! I have to make your sriracha chickpeas!!! And of course, I need to make this delicious salad! I love salads and I love chickpeas, together it’s best salad for me. I will be happy, satisfied after eating this salad. Looks so fresh and delicious!